In 1626, a Mrs Farrow discovered a stream of acid water running from one of the cliffs down to the south of the town. This gave birth to the Scarborough Spa Waters and attracted a flood of visitors to the town from all over the UK. Scarborough became Britain's first seaside resort, a position boosted with the coming of the railway in the 1840s. Scarborough and its Castle on the cliff top changed hands seven times between royalists and parliamentarians during the English Civil War, of the 1640s, enduring two lengthy and violent sieges. Following this disaster much of the town lay in ruins. Scarborough is a family seaside resort going back to the Victorian era where travellers, ladies and gentlemen visited the coastal town of Scarborough to take the benefits of its spa waters with a quick dip in the ocean from a bathing machine. Today its known as the Queen of the Yorkshire Coast and situated just 22 miles from the famous historic fishing port and seaside resort of Whitby on the North Yorkshire Coast. 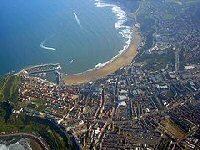 Filey and Bridlington are just a short excursion to the south of Scarborough and York inland to the west is one hour by car or 45 minutes by local Scarborough train services. The modern town lies between 10 - 230 ft above sea level, rising steeply northward and westward from the harbour onto limestone cliffs. The older part of Scarborough town lies around the harbour, sandy beaches and is protected by a rocky headland. Scarborough is served by Scarborough railway station, with services from / to York, Leeds, Manchester and Liverpool on the North Trans Pennine Way route and from Hull via Bridlington and Filey on the Yorkshire coastal railway line. The dramatist, Alan Ayckbourn, is based in Scarborough where he has lived for a number of years. He has produced some sixty plays in Scarborough and is the artistic director of the famous Stephen Joseph Theatre, where almost all his plays receive their first performance. The town also plays host to the annual National Student Drama Festival, which takes place at the Stephen Joseph Theatre, the Spa Centre and other venues around the town. Scarborough served as a commercial port and shipbuilding centre and the herring fishing trade thrived here along with Whitby`s fishing industry. Though much of Scarborough town has changed or evolved over the years, there are many parts of Scarborough town that are now gone forever. They include the Promenade Pier in the North Bay, Scarborough's well-loved aquarium, the cottage in which Anne Bronte died was demolished to make way for the building of the now Grand Hotel, and the site of the Holbeck Hall Hotel before it slid slowly into the sea in 1993, as the cliffs gave way. 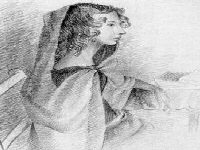 Anne Bronte accompanied by her older sister Charlotte and their friend Ellen Nussey, arrived in Scarborough on 25 May 1849. She was very ill, her advanced tuberculosis having been diagnosed in January only a few weeks after the death of her other sister Emily. 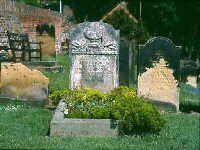 The family had also suffered the loss of their brother Branwell in the previous September. Anne died on 28 May and was buried in Scarborough by her own wish, to spare Charlotte the unbearable task of accompanying her coffin back to their home in Haworth, and her elderly father the anguish of conducting the funeral of his third child to die in the space of nine months. Scarborough was Anne�s favourite watering place, where she had enjoyed happy times in the past with the Robinsons, in whose family she was the governess. Though a cure was not a possibility, she hoped that the sea air would give her a chance to regain a little strength. The trip had however been put off as she was too ill to travel, but it became obvious that if there was to be any chance of the sea air providing some respite from her illness, there must be no further delay. Anne, Charlotte and Ellen took rooms at Number 2, The Cliff, known as �Woods Lodgings�, on St Nicholas Cliff. On Anne�s last evening there was a glorious sunset and the three women sat in the window of their sitting room to enjoy the scene - �grand beyond description�. On 26 May she drove on the sands in a donkey-cart. On the following day, Sunday, she was dissuaded from going to church, but walked a little in the afternoon and sat on a seat in a sheltered and comfortable spot near the beach. Anne Bronte Final Resting Place The following morning however it was plain that a change was taking place. A doctor was sent for, but there was nothing he could do, and she died, peacefully and serenely, at two o�clock in the afternoon. Her last words to her sister, who was almost overcome with grief, were �Take courage, Charlotte, take courage�.